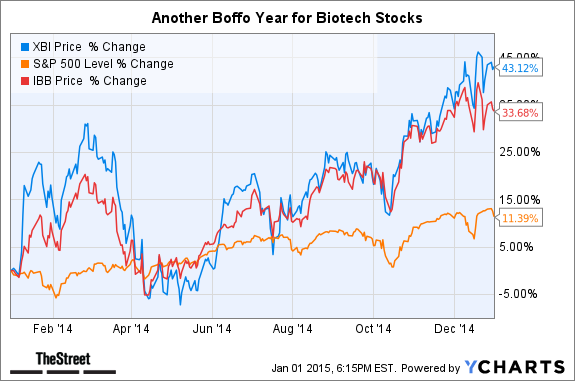 Once again, biotech stocks greatly outperformed the broader market in 2014. NEW YORK (TheStreet) -- Once again, biotech stocks greatly outperformed the broader market in 2014. To give you the wide view, the iShares Nasdaq Biotechnology ETF (IBB gained 34% while the SPDR S&P Biotech ETF (XBI , weighted more to small-cap stocks, rose 43%. The benchmark S&P 500 closed out the year with an 11% gain.